Here's the latest thing for preemies: octopi, which resemble the umbilical cord. The baby holds the octopus instead of pulling on the tubes. How smart is that! These can be knitted or crocheted. 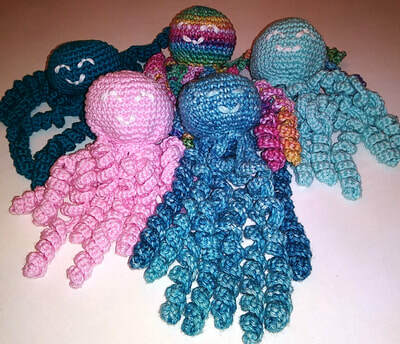 ​You can find the pattern at the official Octopus for a Preemie FB page. Use 100% cotton. My favorite is Hobby Lobby's "I Love this Cotton." So soft.